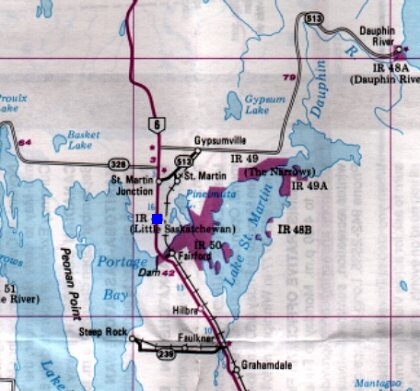 - (1998) CFS Gypsumville was located on Manitoba Highway No. 6, about 155 road miles north-northwest of Winnipeg. The highway bisected the unit; with the domestic site on the east, and the operational site on the west. The two sites were separated by about one-quarter mile. The town of Gypsumville was located 10 miles northeast of the unit, and 6 miles off Highway 6, which went on to the Grand Rapids power development. Map 1 is courtesy Manitoba Tourism. Used with permission.